I took these photographs last summer while exploring the Northern coast of Michigan’s Upper Peninsula. 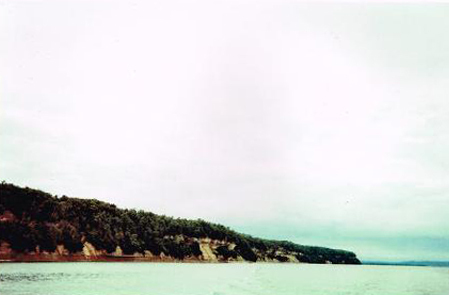 The cliffs are called the Pictured Rocks, and setting off from Munising they extend for forty miles along Lake Superior. As we paddled closer the red underbelly of the cliff revealed itself, indicating a large amount of iron in the groundwater which seeps slowly and unceasingly out of the rock. Up close the cliff was bright as blood but impossible to photograph from the boat. There was also yellow and brown from limonite, and pink and green from copper looking like fresh paint creeping down the sides of the cliffs into the water. The rocks themselves are made of Jacobsville sandstone at least 500 million years old, from the Cambrian era. 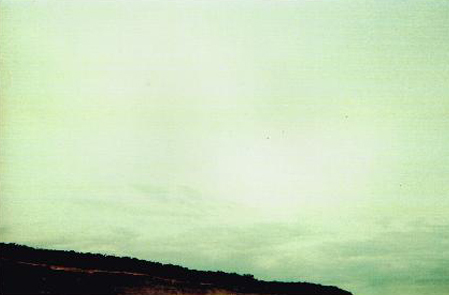 Farther up the shore black and white splotches appeared from manganese and lime. 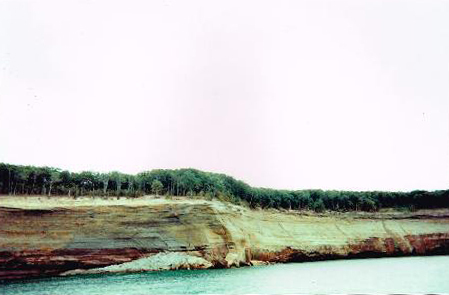 The colors staining the Pictured Rocks give testimony to the passage of time, revealing a silent history marked most recently by the presence of human beings. Like the lyrebird who weaves into its song the sound of chainsaws hacking down trees, or the Peppered moth that has quickly evolved from a speckled white to ashen black in order to blend in with soot, the colors of the Pictured Rocks have been affected by the introduction of toxins and air pollution. With lake temperatures slowly rising and tourists harvesting rocks illegally, large slabs of the cliffs have begun to tumble to the bottom of Lake Superior, taking with them everything they would tell us about the world with their ancient display of colors.